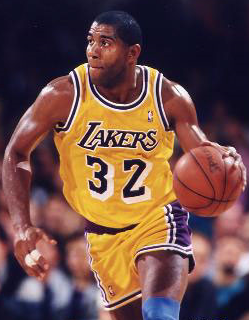 Magic Johnson, voted one of the 50 greatest basketball players of all time, the greatest point guard to play the game of basketball, and according to ESPN.com, the one player that might be better than Michael Jordan. Over his career, he averaged 9.5 points, 7.2 rebounds, and 11.2 assists per game and revolutionalized the game, introducing the face-paced "showtime". He won 5 NBA Championships in the 80s beating out his rival Lary Bird. He's my favourite player. At 6 ft 9, he had the size of a power-forward, one-on-one skills and versatility of a swingman, and the ball handling skills of a point guard. His most stellar performance came in his rookie season playing in the NBA Finals. The Lakers were up 3-2 against Julius Erving's 76ers, but with Kareem Abdul Jabbar sustaining an injury in game 5, he was likely out for the rest of the series. Many expected the 76ers to run over the Lakers in the next games on their way to an NBA championship. Magic however, started at center in Kareem's place, and recorded 42 points, 15 rebounds, seven assists, and three steals, in a 123–107 win, while playing guard, forward, and center at various times in the game. Over his career, his game was characterized by no-look passes, pin-point alley-oops from halfcourt, and game winning clutch shots. In my opnion, there has been no one more fun to watch to play the game.